There are 1.39 billion people on Facebook, and all of them are going to die some day. 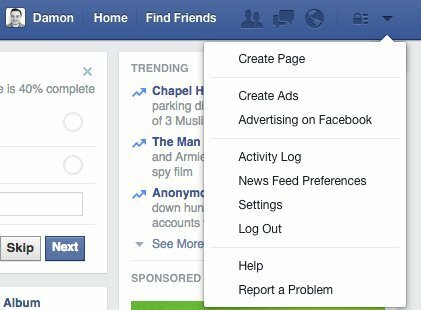 Now, Facebook's making it easier for them to get their affairs in order. A new "legacy contact" feature, announced Thursday on the site's blog, will allow you to select a family member or friend who can control certain aspects of your page once you've passed away. 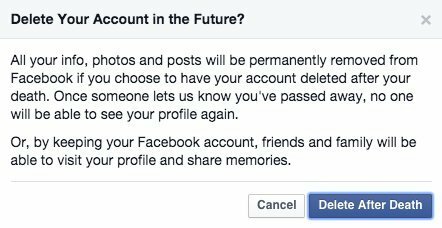 You can also tell Facebook to permanently delete your account after your death, if you'd prefer. Your legacy contact won't be able to see private messages, but they can post to your memorial page, respond to friend requests and change your profile and cover images. If you want, you can give them permission to download an archive of your photos and posts. If you do select the "delete account" option, Facebook will do everything in its power to dissuade you -- but, hey, you can't take your tagged photos with you, right? As The Wall Street Journal Points out, there are a number of differences between assigning a legacy contact and giving someone permission to fully log into your account after you've died. "They [the caretaker] can’t edit what the deceased has already posted, or what his or her friends post on the page," writes the WSJ. "If you chose to post a photo while you are living that looks embarrassing when you are gone, your legacy contact can’t do anything about it. A legacy contact also can’t decide to delete a whole account." The new feature, which comes 11 years after the immensely popular social network launched, follows some controversy about how Facebook has handled deceased user accounts. For example, in 2009 the sister of award-winning journalist William Bemister complained to Consumerist that Facebook would not allow her to remove his page following his death. Facebook eventually did remove the page after it confirmed she was his next of kin -- though the point was nonetheless made that a few hoops needed to be jumped through first.